Four years later, a possible reconciliation agreement between these former allies has fueled speculation of a normalization of relations between the two countries. 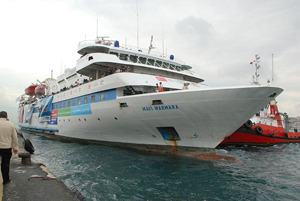 The agreement would entail reparations for the Mavi Marmara victims’ families; a mechanism to rescind all legal claims against Israeli Defense Force officers implicated in the attack; and approval to facilitate Turkish civilian aid to the Gaza Strip. While the proposed agreement does not fully satisfy all of Turkey’s outstanding demands following the incident—an Israeli apology, compensation for the families of those killed on the Mavi Marmara, and a lifting of the Israeli blockade on Gaza—it gets close. During a visit with US President Barack Obama in March 2013, Israeli Prime Minister Benjamin Netanyahu called Turkish Prime Minister Recep Tayyip Erdogan and offered his apologies. Details of payment of compensation are being worked out, as stated by Turkey’s Foreign Minister Ahmet Davutoglu, and while the blockade has not been lifted (nor is this likely anytime soon), Israel and Turkey have agreed to its easing by which Turkey would be allowed special status to deliver humanitarian assistance. Yet, practical as well as ideological challenges to a shared pipeline are significant. For starters, the underwater pipeline would most likely have to travel through Cypriot waters, due to instability in Syria and Lebanon, thereby requiring some kind of agreement on the Cyprus issue. Add to this complications arising from Cyprus’ recent posturing to Egypt as a possible gas field development partner, and waters become harder to navigate. Furthermore, start-up costs for a shared pipeline would be high, the actual level of gas reserves remains unclear, and, as Dan Arbell, a Senior Fellow with the Saban Center for Middle East Policy at the Brookings Institution, confirmed, Israel may not be interested in any sort of energy collaboration with Turkey until ties have politically normalized, even if a pipeline between the two countries would make the most sense economically. “If you lay an undersea pipeline to Turkey and from there to Europe, banking on most of your exports going through Turkey, you have to make sure that relations are smoother than they are now.” Mr. Arbell went on to note that Israel had learned a lesson in dependence from its past experience with gas pipelines from Egypt, which at times were sabotaged or just didn’t work.